When we think of camping desserts, what comes to mind? Ice cream cones from the general store or local confectionery shop, s’mores (come on, they really are a dessert), and bars of some kind that can be made in one pan and kept there until they’re gone. This delicious sweet takes only about 15 minutes to make, and even better, it doesn’t need to be stored in the fridge after the initial cooling, saving you valuable space. And don’t worry about their taking up space on the counter – they won’t last for long. Line a 9 inch baking dish with foil or parchment paper. Combine butter, sugar, and brown sugar together in a large bowl. Mix at medium speed until combined. Add peanut butter and mix until well blended. Stir in flour and vanilla; mixing until just incorporated. Slowly add oats, 1 cup at a time. Fold in M&M’s. Press into prepared pan. Melt together chocolate and heavy cream (in 30 second increments if using a microwave, otherwise just watch carefully if using a saucepan). Once smooth, pour over cookie dough mixture. 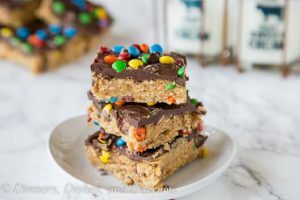 Sprinkle with remaining M&M’s. Refrigerate for 1-2 hours, or until chocolate is completely set up before serving. A cast iron skillet lets the cookie stay gooey and soft on the inside yet crisps up the edges and nicely browns the bottom of the dough. Slice like a pie or just dig in with a spoon. Don’t forget the ice cream! Allow the fire to die down until the fire pit is filled with hot coals. In a mixing bowl, combine the flour, baking soda, baking powder, and salt. Stir slightly to combine. Beat together the butter, white sugar, and brown sugar until smooth. Once combined, beat in the eggs until they are fully incorporated. Slowly mix in the flour mixture and beat together slowly to avoid the flour spilling out of the mixer. Once the flour is completely incorporated, fold in the white chips, blueberries, and cranberries with a spatula until they are evenly combined. Gather the dough into a ball and place it in your skillet. Press the dough down to reach all the edges and make sure the cookie is even and flat. Allow the skillet to sit on the hot coals for about 20 minutes. 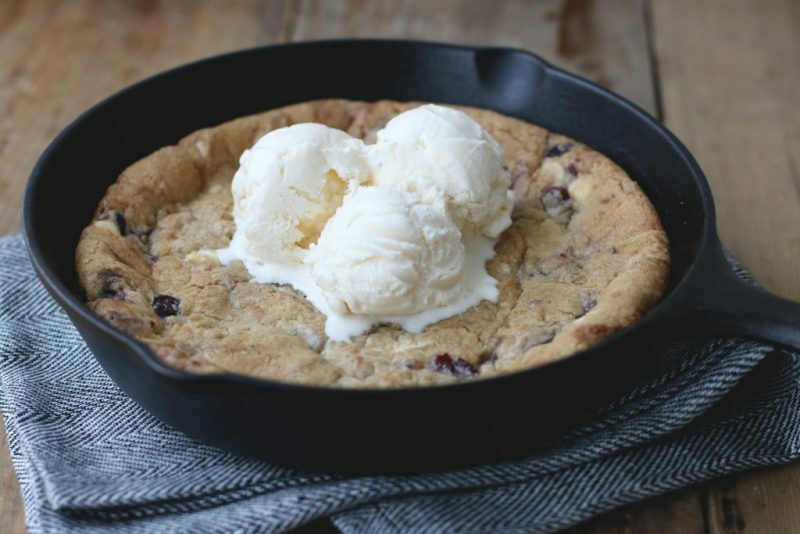 You’ll get the best results if your skillet has a lid and you place a couple hot coals on top of the skillet cookie to create an oven affect. 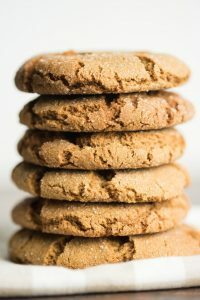 The spices of ginger, cinnamon, allspice, and cloves used in molasses cookies are tantalizing to the senses, and they are a “non-traditional” choice for the campsite. Stir the first seven ingredients together (dry ingredients) in a medium bowl and set aside. In a large bowl, beat the butter until smooth and creamy. Add the brown sugar and 1/2 cup white sugar to the bowl, beat until light and fluffy. Add the egg, vanilla and molasses, beat until just incorporated, scraping the bowl down as needed. With the mixer on low, gradually add the dry ingredients to the butter mixture, mixing until just incorporated. Place the remaining 1/3 cup white sugar on a plate or in a shallow bowl. Measure the dough out by using 2 Tablespoons, roll the 2 Tablespoons of dough into balls. Place the dough balls in the white sugar to coat. Using an ungreased cookie sheet, place 6 dough balls to a sheet, the cookies will be large and will spread. On ungreased cookie sheets, bake 11 to 13 minutes until cookies are puffed up and the centers are soft. Let the cookies sit on the cookie sheet for 3 minutes, transfer to cooling racks to cool completely. Store in an airtight container. Whether you have an oven in your rig, a portable camping stove, or an open flame, you can make some pretty delectable cookies. Share your cookie photos on Facebook, Twitter, or Instagram! Celebrate 78 years at Michigan’s original Maple Syrup Festival. 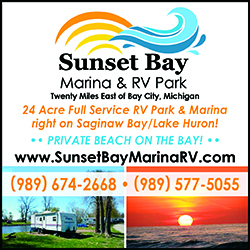 Enjoy pancakes with real maple syrup, rides, talent show, arts and crafts, flea market, two parades, petting zoo, princess pageant, fireworks displays, 5K run, games and more. Syrup producers are located throughout the village selling syrup, candies, crème and the ever-popular maple syrup cotton candy. 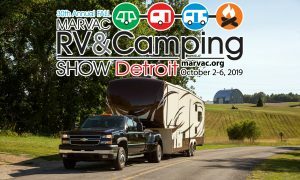 Through legislation, education, marketing and public awareness, MARVAC works to improve the business climate for its members and to encourage growth in the recreation vehicle and private campground industries while contributing to the quality of Michigan tourism.